Rita, Eileen, Ida and Brenda at Undercliff Walk. Eileen and Ida were evacuees from Wandsworth and Balham. In 1939, I was 10 years old. The talk of war and what it would mean filled everyone with a dread, which communicated itself to the children. The relief, which came when Prime Minister Neville Chamberlain waved his piece of paper and announced that the war had been averted, was short lived and the preparations for probable air raids soon became evident. Towards the end of the summer, residents in Brighton were canvassed about hosting London children in the event of evacuation. My parents decided that we could cope with one girl in our small terraced house, the only spare room being very small and what was known as a ‘slip’ room. On Friday 1st September the evacuees arrived. They walked up the street in a long crocodile, accompanied by their schoolteachers and a billeting officer, who dropped the children off at the homes where they had been accepted. Somehow, the one child we were expecting became two little girls. Our spare room was not furnished and was in fact, where my father had a bellows organ, a rather sombre looking instrument that took up a lot of space. We had no spare bed, so for the first few nights my sister and the two evacuees, and I slept in a double bed, cross ways. Eventually Grandma came to the rescue with a bedstead that was put into the slip room and became the bedroom for our newfound friends for the next 10 months. Eileen and Ida came from Wandsworth and Balham. At 10 years, I was the oldest, Ida was 9, Eileen 8 and my sister Brenda was 7 years. Lynton Street already had a large child population and suddenly it swelled to twice the number. It was all very strange at first, but by Sunday 3rd September, we were beginning to get to know one another. My mother suggested that I should take the three girls to Queen’s Park. It seemed that everyone had the same idea. When we got there the park was crowded. We were all having a good time, when suddenly the air raid warning siren sounded. We all knew that if that happened, war had begun and we all expected that bombing would start immediately. The park keeper blew his whistle and shouted at us all to get home as quickly as possible. I herded my little flock together and we started to run home to be met on the way by a big crowd of mothers running towards us to find their children. When we arrived at home, we sat indoors waiting for something to happen but everything was quiet and as it was a lovely warm day, we eventually went into the garden. Of course for a long time nothing did happen. We soon heard about the evacuee’s school, which was sharing Park Street school. The head teacher, Miss Hook was apparently a tartar and we got to know from Eileen and Ida when Miss Hook was displeased. We became very fond of the evacuees, and learned to share everything with them. Christmas 1939 was a very jolly affair, with our enlarged family. Eileen and Ida’s school teachers arranged an outing to the pantomime at the Palace Pier Theatre and an invitation was given to the oldest child of the host family. Being the eldest, I was the one to enjoy this unexpected outing. We walked in crocodile fashion from Park Street to the theatre. It had been snowing and I was enjoying myself sliding along in the snow, when I was brought up sharply by Miss Hook for not walking properly. There were not too many problems during those 10 months, but everyone in the street suffered a plague of head lice, and we all caught chicken pox. Eileen was able to write letters home, but Ida needed help and it became my regular Saturday job to help Ida. Life settled into a routine where we just became a larger family, which seemed all right to me, but looking back on it the extra responsibility for my mother and all the other mums must have been a worry. During what became known as the ‘phoney war’ when nothing happened, life carried on as usual. As a family we visited relatives, went to the Level, enjoyed the race hill and on Sundays, when it seemed that the whole of the local child population attended church, St Wilfrid’s was teeming. Occasionally Eileen’s parents or Aunt came to visit her. 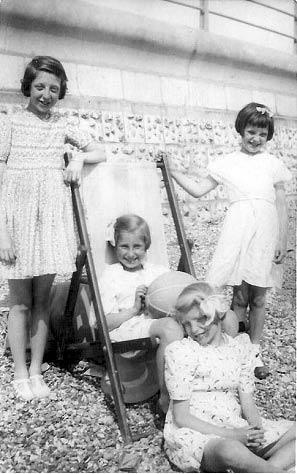 This usually Rita, Eileen, Ida and Brenda at Undercliff Walk meant an extra outing for we four children. At that time it was still possible to go to the beach, and the favourite children’s place, Black Rock. The time came when it was decided that the south coast was not a safe place for the evacuees and they all had to move on. Everyone went to see them off. Coaches were drawn up around Queen’s Park ready to take them to the station. There were many tears and a lot of waving and saying goodbye. We were all sad to see them go. Eileen and her family came to see us after the war and Ida also came with a friend, but after a while we lost touch. Shortly after their departure the Brighton children were medically examined and some were evacuated to Yorkshire, and we were offered the opportunity of going to Canada. My parents decided that my sister and I should stay at home. You say Eileen in the photo, is it Eileen Dowds? She lived near Wandsworth, Eileen is my mum. I was born in Brighton in 1938 and my sister and brother were evacuated from Moulsecoomb to Yorkshire. We spent about 4 years nr Sheffield. We came back before D Day 1944 and lived at Moulsecoomb until mid 50s. Lots of memories. Sister Joan, Brother Michael.Younger sister Janet wasn’t evacuated. I am a member of Kiveton and Wales History Society, near Sheffield and we are currently researching the evacuation of schoolcildren from Moulsecoomb school to our village in 1939. We would love to hear stories from anyone who was evacuated. Dare we ask for photos as well? The evacuees arrived in the evening at Hollingbury Rd. Nothing was arranged and people just stood out in the street and took their pick of the children. We had agreed to have two but the organisers seems not to know what to do. People were just going down and were picking children they liked the look of. My foster mother said it was disgusting and she said we’ll wait and welcome those left. As a result there were two little girls – spotty and freckly and one had red hair. They wore round glasses and she hugged them as if they were beautiful. Betty was a couple of years older than her sister Iris and I had to sacrifice some of my dresses to clothe them. We got on remarkably well and Betty taught me to tap dance – but there was a problem which was that they would eat nothing which was prepared for them and insisted they only ever ate fish and chips. In the end they went back home as they couldn’t settle.